Note the use of the lower-case "L" in place of the "i" in Currin Trading. This false knight went so far as to copy Currin's bio and create a fake version of New Order Logistics. 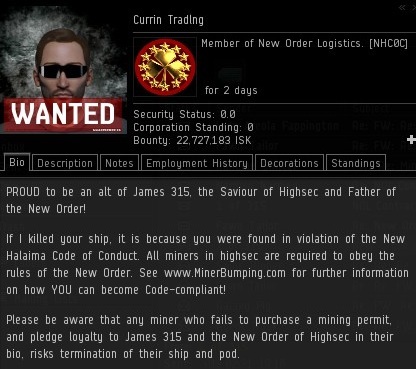 The true New Order Logistics does not contain a "." at the end. Although the perpetrator copied the corp logo and used a similar-looking corp ticker, he did not bother to found the corp in Halaima. I'm told that other Knights of the Order are being impersonated, as well. Don't be fooled! If someone comes into your system claiming to be an Agent and tells you it's okay to violate the Code, you know you're dealing with a fake. A true Agent will never ask you to violate the Code. The Supreme Protector's ganking alt has a PERFECT -10 sec status! Please try harder rebels... do the work. Very impressive replica of Currin Trading! Isn't this against the eula and tos? The James315 replica fooled me, it was so much like the real James, it was rather disturbing. Maybe they feel so empty inside, and despite the fact they want to be part of the Order, they also believe they must feel miserable at all times. To this end, they begin to wear the trappings of the Order, especially our vaunted leader, because their psychosis can be so crippling that the emulation of that which they love/despise can help them come to grips through escapism with the sad reality that all they do is afk mine. Interestingly several of these character names are against the EULA. "You will be assigned a login name and a character name during the registration and character creation process. You may not allow anyone to use your login name or character name to access the System or play EVE. No player may use the character name of another player to impersonate or falsely represent his or her identity. You may not obtain, attempt to obtain, use or attempt to use the login name or character name of anyone else." It's because they never bother to read up on the rules of the game. Being that they're too lazy to not AFK mine, are you really surprised? It is really amazing they disregard the EULA, and don't get reported, especially with those alleged RL death threats. I'm not really trying to get anyone in trouble though, just mentioning, it is all in anger after all, and we know anyone can say things they don't mean out of anger. I report every single one that does it to me, because they need to learn that such actions will actually have consequences. 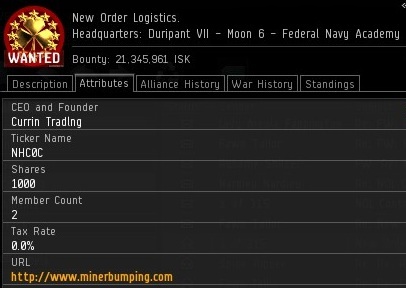 Regardless of it being said in anger, CCP's position on the matter is very clear, but CCP don't monitor chat logs, so it's up to anyone that sees it to actually file a report. Apart from that, I never take the threat seriously because I'm actually quite hard to find. Maybe SIONKOP should be directed to this post to find a real definition of cyber-bullying. Why does that should consequently? Should you glance at the impressive although "Vivante" arranged, you'll uncover why. Even though these somewhat watches really are saved for the fake Breitling watches current wrist and also anywhere better, Imitation de qualite Bell & Ross they're only just stunning. They still make all of these showcasing in sometimes a new steel and also buckskin music group. Their dials are created from mother-of-pearl even though another extravagant Replica Ulysse Nardin watches UK models transpire adorned alongside precious gem stones. Business users must add a model planned for ornate express. Their personally own business montres Breguet faux spouses together with buyers holds an awesome effect of which after they develop actual "Ambassador" individual watches. For those athletes, the "Active" distinctive line of wrist watches is made for them. Chosen for Breitling Replica Watches the timepieces could quite possibly run even though 330 feet underwater.